The event was organized by Maks vzw on December 17th 2018. The venue of the event was Socius, right next to the recently opened museum of modern art Kanal centre Pompidou in Brussels. Socius is a non-profit organisation for socio-cultural adult work. The venue is situated on the 4th floor with a nice view of the north side of Brussels. The target groups for the multiplier event were Face2Face workshop participants, external experts, teachers, youth workers and trainers from formal, non-formal and informal educational field. The core of the event was to present the Brights project and the policy recommendations that came out of the project. Around 20 people took part in the event. During the Brights multiplier event Jochem Devens, Multimedia animator at Maks vzw and national BRIGHTS tutor for Belgium, presented the BRIGHTS project and the policy recommendations. The event started with a PowerPoint presentation and 3 Digital Stories from the project. One of the participants, Ann De Martelaer, who also followed the MOOC and the Face2Face-workshops, had a surprise for us: She made Digital Stories with adults with disabilities who are looking for real, paid jobs. Even though the story is not eligible for the Brights project because the maker of the story is already 25 years old, it was very valuable to show this story because it shows the power of Digital Storytelling. Anneleen, a woman with Down Syndrom dreams about working as a fashion model. For the second part after the presentation and videos, a discussion about the project and its policy recommendations was held. Printouts of the recommendations were laid out in front of the participants to start the discussions. How can Digital Storytelling be used for an audience of youngsters who are not very motivated to be in formal or non-formal education and for whom GCE is very abstract? How can the project reach more secondary schools, teachers, staff, policy makers? School teachers should be able to follow the MOOC and F2F workshops during their hours of in-service training. It could be offered through the education networks to make it more available. 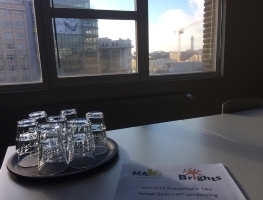 As the Flemish government is in the process of adopting the Paris Declaration from 2015 and implementing Global Citizenship Education, the BRIGHTS-project can be a best practice to work with in many more schools in Brussels and Flanders.